Chicago-based artist Ravyn Lenae looks at the crowd, making eye contact with fans only a few inches away. 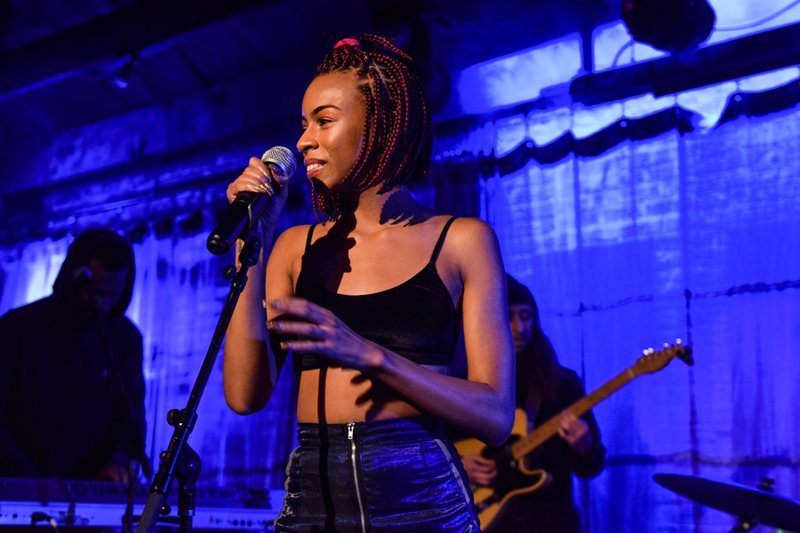 Lenae, along with Knox Fortune, performed at SPACE Thursday night. Chicago-based artists Knox Fortune and Ravyn Lenae took the stage at SPACE Thursday night, providing audience members with an intimate performance. The event, put on by A&O Productions, attracted approximately 150 students, whose ticket proceeds went to Northwestern Arts and Music Programs for Education in Detention Centers. Kerry Brown (SESP ’14), an AMPED coordinator, got involved with the organization during her time at Northwestern before picking up a full-time position after graduation. She found the hip-hop composition program — which connects students with incarcerated young men in Cook County — to be special and transformative, she said. Fortune began the night, stepping on stage to an eager crowd, and sang songs from his recently debuted album, “Paradise.” He also performed the unreleased song “Shirtless” and a rendition of “All Night,” a popular 2016 hit with Chance the Rapper. Lenae’s high-energy dancing and range of vocals provided a change of pace from Fortune’s performance, which was more relaxed and laid-back. Both, however, easily interacted with the crowd thanks to SPACE’s small size. Audience members sang into microphones with the artists and gave out hugs. Isabel Schwartz, a Lenae fan, experienced the concert from the front row and was one of those lucky audience members, making it what she called one of the best shows she’d ever seen. A&O co-chair Louisa Wyatt said she hoped the show would bring quality local music to Northwestern students, as both artists are Chicago-based, she said. Wyatt also hoped the concert would allow students to leave having had new and unique experiences, she said.